They might not be as legendary or scary as The Flying Dutchman, but these modern-day ships, either owned by Russians or found in Russian waters, had been abandoned and drifted slowly to nowhere. One ship even supposedly was taken over by cannibal rats. In early October 2017, a mysterious ship was discovered in the Baltic Sea, close to the shore of Russia’s Kaliningrad Region. No one was found aboard the large yacht, which had a broken mast and a big hole on the side. Also, the fridge was full of food, and an uncharged computer tablet was on the table. The Defense Ministry, which discovered the “ghost yacht,” towed the drifting boat to a nearby naval base. After a few days they learned that the ship’s owner was a Polish businessman who participated in a regatta in late September. The yacht had crashed and the captain was rescued by the coast guard. For weeks, Loxa (the name of the yacht), drifted in the sea until it reached Russia’s coast. The owner had been sure that his boat would sink, and now he has no desire to have it returned because that would require too much effort and money. Loxa will probably be scrapped. Three years ago there was a much more exciting story with another ghost ship connected to Russia. It even scared the hell out of many people who were afraid of being attacked. Named after a famous Soviet actress, Lyubov Orlova was built in Yugoslavia but stoically served the USSR and Russia as a cruise liner from 1976 to 1999. Its fate changed dramatically when the company that bought the ship went bankrupt. So, Lyubov Orlova was stuck in Canada from 2010 to 2012. While being transported to the Dominican Republic to be turned into scrap, the ship ‘escaped’ when the cables burst during a storm. Lyubov Orlova disappeared in the ocean, becoming a major headache. First, a ship with a displacement of about four tons, without electronic systems and identification lights was dangerous for other ships navigating nearby. Second, the possible sinking of such a ship would inevitably harm the ocean environment. Finally, even a ship that will be scrapped is worth a lot of money: in this case, around $792,000, according to the Russian newspaper, Argumenty i Fakty. For more than a year the empty Lyubov Orlova roamed the Atlantic Ocean, and became a sort of Holy Grail for both sailors and adventurists trying to find it and make money out of it. Stef Braun, an Australian citizen, even created a website – whereisorlova.com – where he collected information about the ghost ship, (now unavailable). The hype around Orlova peaked in January 2014 when several British tabloids, including The Mirror, reported that the ghost ship was heading towards the shores of Great Britain and Ireland. What’s more, they speculated it was filled with rats that had turned into cannibals during the journey. These rats would be dangerous for people, the newspapers suggested. This ‘perfect’ scene for a Hollywood horror movie (“giant cannibal rats from ghost ship attack hapless citizens”) never came true. Lyubov Orlova entirely disappeared, however, and most likely sank. The question whether there were cannibal rats remains unresolved forever. 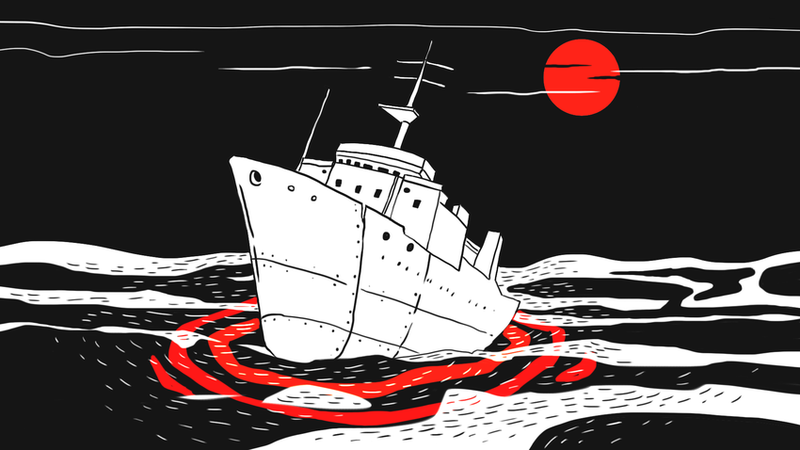 Most ghost ship stories from Russia are much less dramatic than the previous one. Typically, these “ghosts” are ships left in ports because they became unprofitable for their owners who were unwilling to pay the fees and taxes, as well as the sailors’ salaries. Such ships usually rot slowly because the authorities are often unable to remove it for legal reasons. The fate of a dry cargo ship that burned in the port of Vladivostok in January 2017 is a good example. Yeruslan had already been abandoned for two years, and its owner, who owed the crew more than $200,000, mysteriously disappeared. The crew became desperate and left Yeruslan, and it remained abandoned until the fire. While the ship was burning, some locals stole what they could from it. A truly sad destiny for any ship, even a ghost one. This article is part of the Russian X-Files series in which RBTH explores Russia-related mysteries and paranormal phenomena. Why are Russians still searching for Bigfoot? Goldfinger: Where did the communists hide their treasure after the USSR's collapse?